Two months after the attacks of 9/11, the Bush administration, in the midst of what it perceived to be a state of emergency, authorized the indefinite detention of noncitizens suspected of terrorist activities and their subsequent trials by a military commission. Here, distinguished Italian philosopher Giorgio Agamben uses such circumstances to argue that this unusual extension of power, or "state of exception," has historically been an underexamined and powerful strategy that has the potential to transform democracies into totalitarian states. 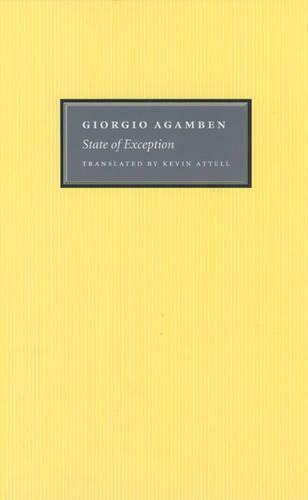 The sequel to Agamben's Homo Sacer: Sovereign Power and Bare Life, State of Exception is the first book to theorize the state of exception in historical and philosophical context. In Agamben's view, the majority of legal scholars and policymakers in Europe as well as the United States have wrongly rejected the necessity of such a theory, claiming instead that the state of exception is a pragmatic question. Agamben argues here that the state of exception, which was meant to be a provisional measure, became in the course of the twentieth century a normal paradigm of government. Writing nothing less than the history of the state of exception in its various national contexts throughout Western Europe and the United States, Agamben uses the work of Carl Schmitt as a foil for his reflections as well as that of Derrida, Benjamin, and Arendt. In this highly topical book, Agamben ultimately arrives at original ideas about the future of democracy and casts a new light on the hidden relationship that ties law to violence. ""State of Exception" is a timely and compelling inquiry into the capacity of state power to withdraw the guarantees of legal protection and entitlement, at once abandoning its subjects to the violent whims of law and intensifying state power. Not to be conceived as merely occasional and conditional, invocations of a state of exception have come to constitute the basis of modern state power. Agamben deftly considers the historical and philosophical implications of this power, offering a brilliant consideration of 'life' and its tense relation to normativity. This is an erudite and provocative book that calls for us to 'stop the machine' and break the violent hold that law lays upon life." "The impact of Agamben's thought since the publication of the first volume of Homo Sacer . . . has been immense not merely in the field of continental philosophy but also in political and legal theory, sociology, and in literary and cultural studies."--M. Canstantinou and M. Margaroni "Continental Philosophy "
"State of Exception is a timely and compelling inquiry into the capacity of state power to withdraw the guarantees of legal protection and entitlement, at once abandoning its subjects to the violent whims of law and intensifying state power. Not to be conceived as merely occasional and conditional, invocations of a state of exception have come to constitute the basis of modern state power. Agamben deftly considers the historical and philosophical implications of this power, offering a brilliant consideration of 'life' and its tense relation to normativity. This is an erudite and provocative book that calls for us to 'stop the machine' and break the violent hold that law lays upon life."